Once upon a time, a person called Chandravarna, a Brahmin, was living in Brahmin Agraharam of Nandi Puram town. He was a master in many arts and sciences. However, he was not satisfied with the knowledge and mastery he possessed. He was longing to learn increasingly. Searching for a teacher who can quench his thirst for knowledge he remained a bachelor. Every minute he used to search and research about some thing or the other. As he could not find a master to suit his needs in the native place, he left Nandi Puram. Even after scanning through many kingdoms and towns, his effort went in vain. Little disgusted with the towns and cities, which could not provide him an authentic Guru he took to forests. His physical condition was dropping, as he did not attempt for a right intake to satiate hunger. In that condition he was wading through a forest, he felt very thirsty. He searched for a water source and walked ahead. A few yards away, he saw a lake and a sprawling tree on the banks. Chandravarna filled his belly with lake water and laid under the tree to relax a while. He was filled with thoughts and doubts about finding a Guru to quench his thirst for knowledge. Can I find a noble Guru? How long would it take to satisfy my wish? Thinking on these lines, gradually he slipped into deep sleep. A demon was taking shelter on the tree under which Chandravarna rested, since many years. The demon contrary to the normal behaviour of destructive culture was a learnt one. He was a scholar of many sciences. He was meditating for the blessings of Lord Brahma (Deity of Creation) to attain salvation. Every time after he completed meditation for the day, he used to attend to the nature calls and take bath in the adjacent lake. Chandravarna saw the Demon. Having no scare of the Demon, Chandravarna presented salutations to him. Sir! My name is Chandravarna. I belong to Nandi Puram. I started my journey in search of a Guru to learn sciences not learnt earlier. The glow on your face expresses your knowledge as a well-learnt person. I request you to be my Guru and teach me all that you can and bless me. Demon was satisfied with the way Chandravarna expressed his desire and the truth. Looking at him pleasantly the Demon said, Chandravarna! Your goal to learn as much as you can is definitely appreciable. I will teach you what all I know. You should learn them with all concentration. You should not waste my time. Once you follow my guidelines you will be mastering everything in a short span of time. Chandravarna over whelmed with joy and touched the Demons feet for blessings. Guru! I will follow you and face all the troubles happily in the process of learning, he promised. Look Chandravarna, I will be writing all the contents that I wish you should learn on the leaves and drop them one after the other. Consistently, for six months you should go through the leaves and learn the contents. During these six months, you should not rest even for a minute. You will be perfect if you follow this schedule without any violation. Otherwise, you have to face my raze. Be careful, the Demon persistently said. Chandravarna took oath that he would not bow out of the effort. With this, the Demon pleased and said, Chandravarna! Your commitment and dedication fascinated me. I will teach you a Manthra. Chanting this Manthra wholeheartedly relieves you from starvation and slumber. Later, Demon taught a Manthra to the disciple. Chandravarna, relieved from hunger and sleep with the power of Manthra, incessantly learnt all the education from Demon, through the dropping leaves. By the time Chandravarna completed his learning the Demon completed austerity. After the scheduled six months, the Demon appeared before Chandravarna. A distinctive splendour was emanating from the Demon's body that surprised Chandravarna. Chandravarna! Due to a curse, I took birth as Demon on earth. The malediction on me was relieved with the blessings of Lord Brahma, because of my meditation for him. 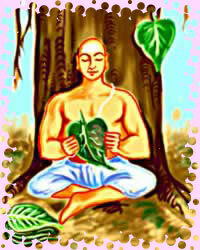 In a short while, I will be taken to Brahma Loka (The world of Brahma). You are a perfectly learnt human now." Immediately, you leave to your country. Marry a suitable girl and live happily with all the worldly riches Demon continued, All your learning should be useful to all. Meanwhile, the Sacred Brahma Chariot appeared before them. Blessing Chandravarna, the Demon transformed into a glowing divine light form and went on to the Chariot and left to Brahma Loka.